Adrienne Costin from Autism Queensland (L) receives the cheque from Nicole Carr, Franchisee at Quest Eight Mile Plains. Quest Eight Mile Plains has donated $2,000 to Autism Queensland, a not-for-profit organisation with a vision for a life of participation, opportunity and choice for people with Autism Spectrum Disorder (ASD). Hotel Franchisees, Michael and Nicole Carr said they were were honored to present the donation to Autism Queensland, highlighting Quest’s ongoing commitment to supporting the local communities in which they operate. “Autism Queensland is Queensland’s longest serving and most experienced agency in the delivery of early intervention, education and training, therapy and respite care for people living with ASD. We are very proud to contribute to such a worthwhile charity that supports families in need and hope to motivate others to do the same,” Mrs Carr said. 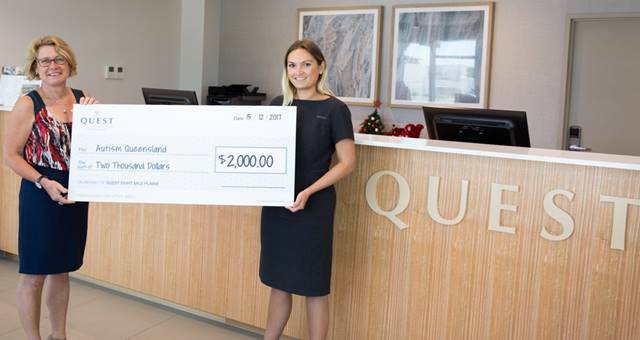 Autism Queensland Manager Marketing Communications Adrienne Costin expressed her sincere gratitude to Quest Eight Mile Plains for its generous donation and commitment to ongoing support. Quest Eight Mile Plains opened its doors in July 2017, boasting 90 apartments – a mix of studio and one, two and three bedroom apartments. The purpose-built property provides the perfect “home away from home” with fully-equipped kitchen, business lounge and on site gymnasium.